Halloween is here and you know what that means – pumpkin patches, corn mazes, and haunted houses! Mark your calendar for our 8th annual Harvest Festival on Saturday, November 3rd from 10 am-2 pm. Admission is completely FREE! Tucson Village Farm is located at 4210 N. Campbell Avenue. Come celebrate your memories, and make new ones, with our fifth annual salute to the fiery chile and decadent chocolate. 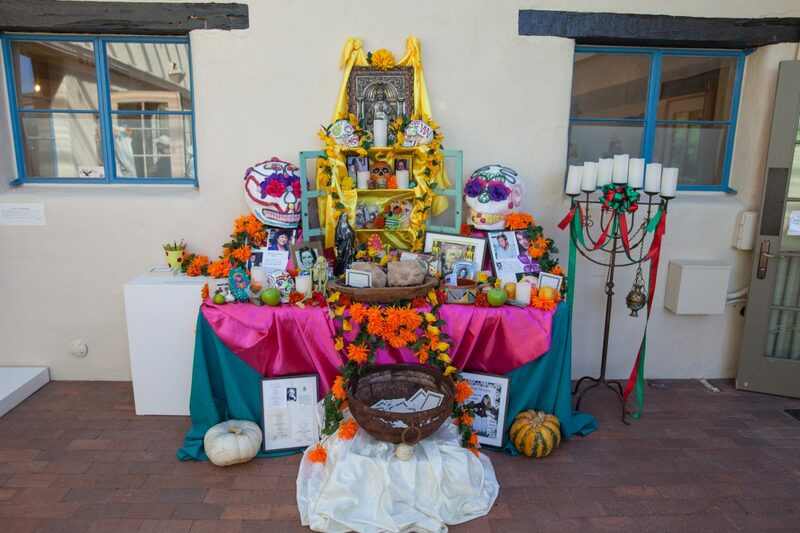 Dozens of food and craft vendors will fill the grounds and personal ofrendas (altars) from local artists and schools pay homage to the enduring borderland traditions of Día de los Muertos and a community altar invites guests to leave recuerdos (remembrances) of lost loved ones. There will be musical entertainment with a Latin beat from the Rafael Moreno Quartet, Entre Peruanos, Jovert Steel Drum Band, Mariachi Aztlán and Michael Salerno; Day of the Dead-themed face painting (and children’s activities on Saturday) and the Garden Bistro will be serving a special harvest-themed farm to table dinner on Friday evening, Oct. 26! A traditional Day of the Dead shrine, or ofrenda, for guests to honor loved ones with personal offerings, and mementos, will be set up in the Nuestro Jardin throughout the month of October. Traditional dancing skeletons will also adorn garden pathways and add to the spirit of the event. There’s a little something for everyone – a pumpkin patch (you pick), corn maze (test your best time), jumping pillows, a petting zoo and so much more! Enjoy old-fashioned family fun picking your own pumpkins, fall vegetables at the Farm and apples at the Orchard. Pumpkins of all shapes, sizes and colors will be available for picking in our huge pumpkin patch. Already picked pumpkins will be available at the pumpkin stand. Don’t miss out on Arizona’s largest and absolutely amazing CORN MAZE; with 2 levels of difficulty it’s perfect for the entire family! Tons of fun for the whole family! This is a fall event that appeals to the young and the young at heart. This experience is not for the faint of heart. TUCSON, AZ (Tucson News Now) – October is just around the corner and you know what that means – pumpkin patches, corn mazes, haunted houses and Halloween! It’s that time of year when Bashas’ Supermarkets become Spooky-markets as Arizona’s family-owned grocer invites families to celebrate Halloween at each of its 56 Bashas’ stores across the state (including the those in Tucson) on Saturday, Oct. 27 from 10 a.m. to 2 p.m.
From witches and ghosts to superheroes and cartoon characters, children of all ages are invited to show off their Halloween costumes and have a lot of fun taking part in all of the family-friendly activities in the store. Free apple cider; and Tons of photo-taking opportunities! Bashas’ Halloween Party is an opportunity for children to celebrate the holiday in a safe and fun, family-friendly environment during the day. It’s also an alternative for those who prefer not to trick-or-treat door-to-door in the dark. Town of Sahuarita 7th Annual Halloween Spooktacular! Is a fairy born without wings truly a fairy? Can such a fairy have magic within themselves? Dawn doesn’t think so, for she is just such a fairy, and her father, Lore, cannot convince her otherwise. But when Lore is kidnapped and Valley of the Moon is threatened by the evil fairy Nocturn, Dawn must embark on a journey during which she may just learn that, with or without wings, the power of kindness is magical in and of itself. ADMISSION: Adults: $10; Students: $5; Members & Children 7 & under: FREE; Tickets can be purchased online at Yapsody.com or at the ticket booth during performance times. For the first time ever, QuikTrip will give away a free ice cream cone to trick-or-treaters ages 12 and under on Halloween night. Children must be dressed in costume and trick-or-treat inside any QT between 4 – 10 p.m. to receive the free treat on Halloween night, Wed. Oct. 31 from 4 p.m. to 10 p.m. at all Quik Trip stores. Chipotle will also be taking the celebration to social media, holding an Instagram costume contest on Halloween. To enter, Chipotle fans must post a photo of themselves in costume, at a Chipotle restaurant, on their Instagram profile or Instagram Story and tag @CHIPOTLE. Chipotle will then select eight finalists and post the contestants’ photos on the brand’s Instagram Story. Fans will have the chance to vote for the “Boorito Champion” by ‘liking’ their favorite costume from 9 a.m. to 5 p.m. Eastern time on Nov. 1. One lucky winner will enjoy the sweetest treat of all – a year of free burritos. The winner will be announced at approximately 6 p.m. Eastern time on Nov. 1 via Chipotle’s Instagram account. For more information about this year’s Boorito celebration, and the Burritos for a Year contest, please visit WWW.CHIPOTLE.COM/BOORITO.